The Combat Management System (CMS) for the Indigenous Aircraft Carrier (IAC) developed with M/s Tata Power Strategic Engineering Division (TPSED), in collaboration with Weapon and Electronics System Engineering Establishment (WESEE) and M/s MARS, Russia was handed over by Mr Sukaran Singh, CEO and MD, M/s Tata Advanced Systems Ltd. to Indian Navy/ Chief of Materiel, Vice Admiral GS Pabby, PVSM, AVSM, VSM on 28 Mar 19 at M/s TPSED, Bengaluru, on successful completion of all tests and trials. 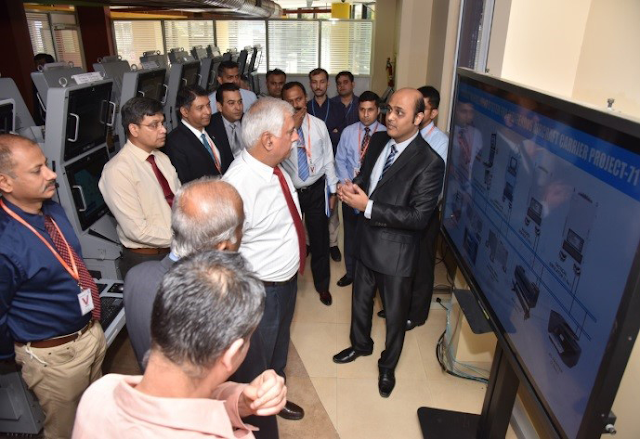 The event was attended by Rear Admiral Antony George, NM, VSM, ACNS (SR), Rear Admiral SK Nair, NM, ACOM (IT&S) and other senior officers from the Indian Navy, and M/s TPSED, including firm’s COO, Mr NeeleshTungar and CTO, Mr R. Muralidharan. This is a major landmark on IN’s thrust towards GoI's policy of 'Make in India' to encourage indigenous development and promoting private industry participation. It also assumes great significance as it is the first CMS developed by a Private Industry for IN and is for India’s Indigenous Aircraft Carrier. Prior accepting, the system software and hardware were subjected to rigorous acceptance trials. The system successfully cleared all acceptance tests, endurance and full load trials.